From KMPC, we stopped at a fast-food place for lunch before heading back over to Glendale to see Verdugo Peak in the company of KROQ-FM's Fred Holub. This group shot of the towers at the summit was actually taken on the way back down. The four monopoles are the remaining KROQ (1500 Burbank, now KIEV Culver City) towers; there were six originally. The monopole on the far right has the KXOL-FM (96.3B Los Angeles) temporary antenna bolted to it. The painted tower in the middle holds KROQ-FM (106.7B Pasadena) up top, and a backup for KRTH-FM (101.1B Los Angeles) below. 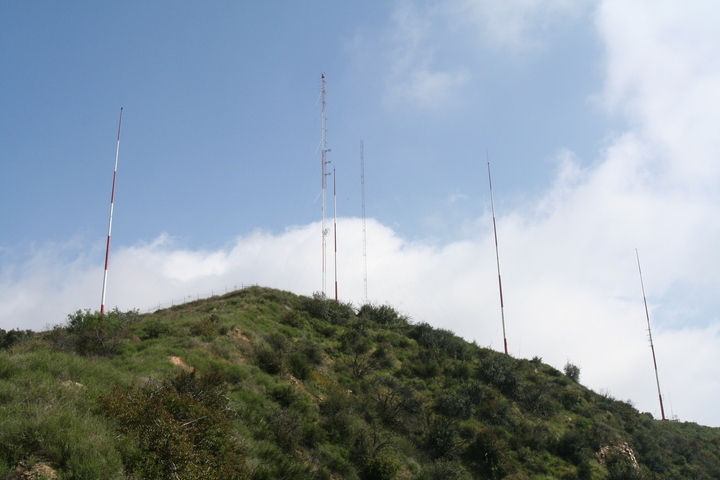 The unpainted tower to the right of that is a new tower being erected to hold backup antennas for CBS's other Mount Wilson FMs: KCBS-FM (93.1B Los Angeles), KTWV (94.7B Los Angeles), and KLSX (97.9B Los Angeles). There's been some talk that CBS might want to put a TV backup facility up here, but nothing official. CBS is building a new building atop the mountain to house the backup transmitters, for reasons which will shortly be obvious.